Take an iconic Alaskan bush-plane tour over mountains, glaciers, rivers and wildlife over 33 miles of wilderness to arrive at Wood River Lodge’s private airstrip.Fly Denali is a professional flight seeing company that offers premium flights to Wood River Lodge. They operate two Turbo Beaver aircraft, a Cessna 185, and a Cherokee 6. Flights typically originate at the Healy airport just outside of Healy, Alaska (15 min from Denali Park entrance). However, flights from Fairbanks or Denali can be arranged. The typical Fly Denali scenic tour is over $500 per person, but we have arranged the special price for your scenic trip for $200/person or $600 for the whole plane (seats 5). Larger groups can contact us about the Turbo Beaver which seats 9. Other flightseeing trips are available such as: wildlife/scenic tours, Denali Mountain, and even glacier landing. Contact Fly Denali for prices. Wood River Lodge is completely surrounded by wilderness. The Wood River creates the southern border of the property. The lodge is nestled at the base of Mount Anderson which makes for an unsurpassed mountain view. 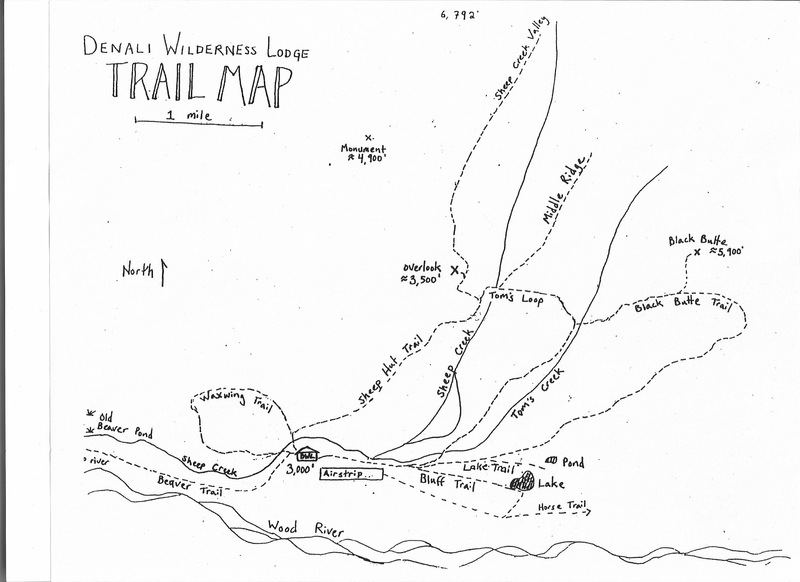 10 marked trails originate from the Lodge grounds and take hikers to amazing destinations. You can follow the river, take a trail to the peak of Mount Anderson, visit Swan Lake, or Moose Pond. The trails can be as short as ½ mile or go all the way to Healy – 33 miles away! 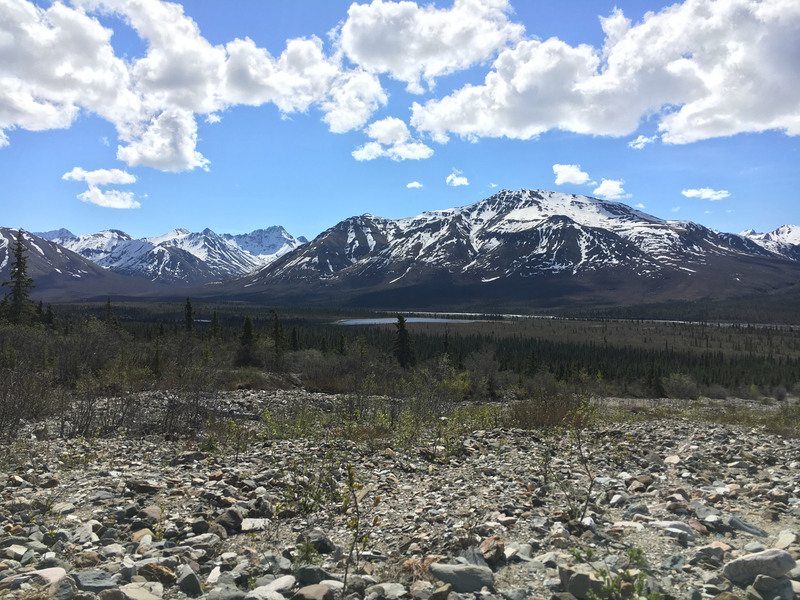 Several skill levels of trails can be found at Wood River Lodge as you leave the coniferous treeland of the Taiga and enter the Tundra with it’s open vistas and varied wildlife. 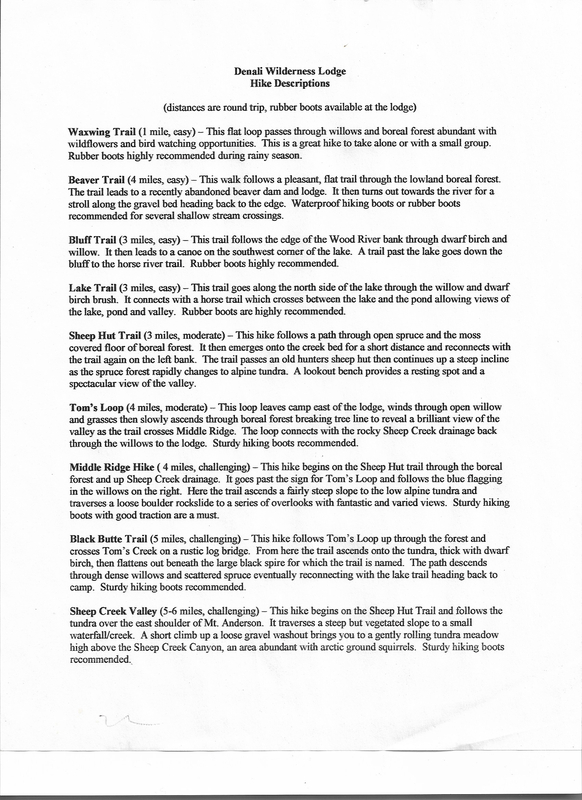 See our Trail Map and Trail Guide. A short hike from Wood River Lodge will lead you to Swan Lake. A canoe and paddles await the adventurous for a day of paddling and playing in a remote Alaskan lake. As it’s name implies, Trumpeter Swans, several variations of ducks, Sandhill Cranes, and other water-loving birds can be found at the lake as well as the occasional moose and caribou. Life jackets are supplied at the Main Lodge. Alaska invented the Fat tire bike! These mountain bikes have 4” wide soft tires for pedaling the various terrain of the various marked trails.Bikes, water bottles, and helmets are supplied at the lodge. You must provide the Pedal Power! Being so far from “civilization” has it’s advantages when watching for wildlife. Bird-watching for Swans, Cranes, Owls, Eagles, waterfowl, grouse, ptarmigan, and various songbirds is top notch. Common Small critter viewing can include snowshoe hare, squirrels, porcupine, fox, coyote, and the occasional ermine, martin, wolverine, wolf, or lynx. Common big game sightings include Moose, Caribou, Dall Sheep and the occasional black or grizzly bear.